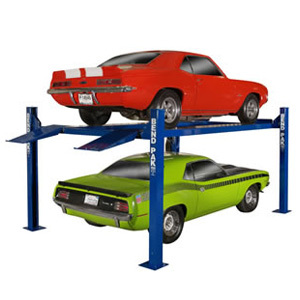 BendPak Lifts – Platform Parking Lift –PL-6KDTX – 12,000 lb. 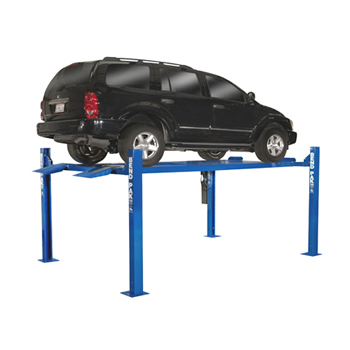 Lifting Capacity - Gary Bloom Sales, Inc.
For wide-clearance vehicles, we’ve made the columns of the PL-6KDTX car lift a little wider. This ensures that truck mirrors gracefully pass through the lift structure, and vehicle doors have a little more room to open and close. Some folks find the extra space more accommodating when they need to access the vehicle. The PL-6KDT is an indoor-outdoor tandem-style car lift that holds a total of four vehicles in its 224″ x 205″ x 103″ frame. Dual hydraulic cylinders and a pair of stabilizing lifting cables support two lifting platforms. The cables are routed internally throughout the parking lift. This lift is intended to be used by anyone with four vehicles and a wide garage area to store them. Each platform holds up to 6,000 lbs., for a total of 12,000 lbs. when fully loaded with two vehicles. 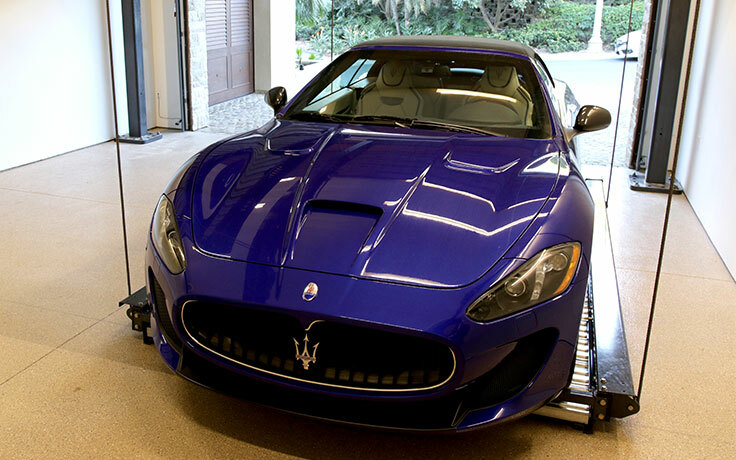 You’ll be surprised to see how well this unit fits in a variety of garage sizes. In the right space, it can be successfully utilized for commercial or residential purposes. For many car enthusiasts, municipal parking lots and professional shops with limited parking space, the only way to park vehicles has been to buy multiple parking lifts and place them side-by-side, as close together as possible. This not only takes up an obscene amount of space, it’s expensive to keep buying more lifts. 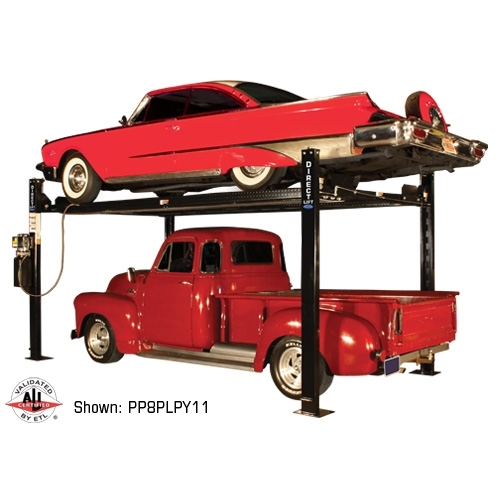 The PL-6KDT will hold most vehicles up to 6,000 lbs., and because it doesn’t have any posts between the two lifting platforms, you can fit this double-wide lift in most two-door garages. In the rare event of cable failure, the car lift features a secondary cable slack detection that catches the platform(s) on the locks. All cable-oriented BendPak lifts offer this design feature. Many other companies’ parking lifts do not. 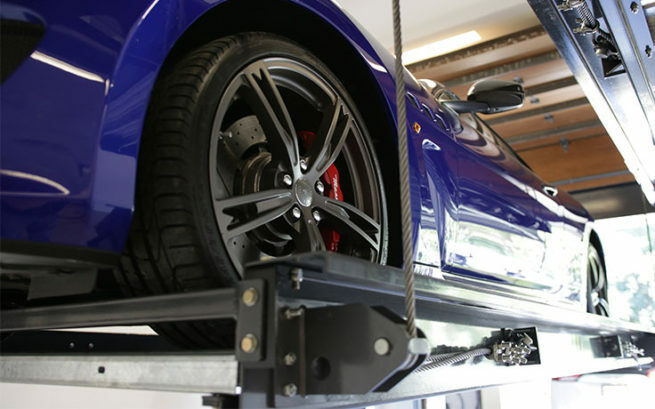 Vehicle parking lifts offer a safer alternative to parking multiple cars in the driveway or street. Rather than being forced to park your precious cargo outdoors where it gets exposed to weather, accidents and theft, you get to keep your vehicles safely tucked inside. There’s no price tag on your peace of mind. This parking lift can be configured for 110V or 220V operation. International voltages are available. 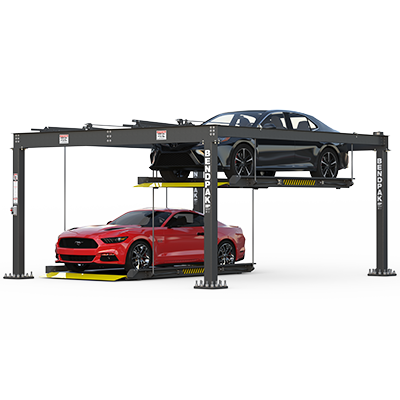 The PL-6KT is a triple-platform platform parking lift that fits a stunning number of vehicles in a minimal amount of space. With this unique design, three vehicles fit side-by-side on the lower level, ​yet only one needs to be pulled​ out in order to access the vehicle parked directly above it. There’s simply no better opportunity to expand your parking capabilities with a large number of vehicles. Keep your daily drivers ready to go and your weekend and track cars safely (and attractively) stored for your convenience.